The millennium committee was conscious of honouring the parish’s greatest benefactor Dr. Joseph Byrne and the opportunity presented itself in the year 2000 when the area inside what is known as “The Grand Gates” leading to “The Lawn” was completely transformed from a swampy over-grown area into an amenity park. Possibly one of the most spectacular thunderstorms of the millennium provided the background for the opening of the Park, on Friday August 25th. Present were Mrs. Meaney, niece of Dr. Byrne, many members of Carlow Co. Council, Bishop Laurence Ryan, Bishop of Kildare and Leighlin and many other dignitaries. The development of the Park included drainage, removal of all existing shrubbery and undergrowth, installation of drainage stones and pipes, cleaning of stream and shaping banks, leveling ground, preparing and sowing same, constructing a gravel path, erecting a fence, planting three areas of shrubs and dogwood on the banks, providing seating near the stream, establishing a picnic area near the gate and providing suitable planters for seasonal flowering. The work was carried out by professionals with immense voluntary labour. This labour was provided by the members of the Millennium committee and Myshall/Fenagh Macra Na Feírme members. The development of the Park was entered into the Green Town 2000 Awards scheme and to the delight of all concerned was awarded £1,500. 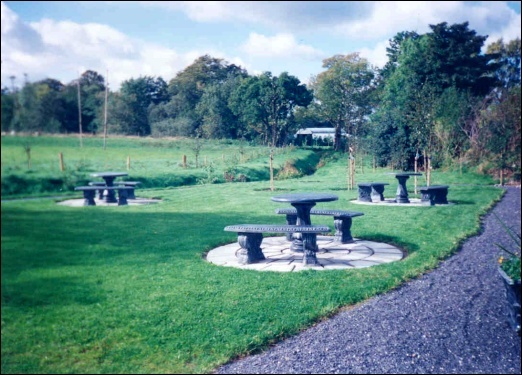 An enjoyable tree planting ceremony took place in the Spring of 2000 when quite a number of clubs and organisations sowed their own millennium tree there which were given by Carlow Co. Council as part of the Tree Planting initiative. A colossal 8 stone of daffodil bulbs were sown that make a colourful impact each Spring. The Myshall/Clonard Twinning, and other events were marked with tree planting in the park during that memorable year. It is a viable tribute to Dr. Byrne and is a pleasant area for young and old to enjoy. 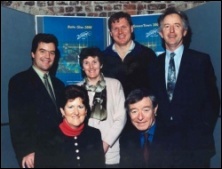 The Myshall/Drumphea Millennium Committee of Ena Jordan, Babs Doyle, Brigid Fox, Patsy McLean, Sean Keogh, Peter Jordan, John Nolan and Charlie Murphy is very proud of its achievements, it did not dissolve at the end of the year 2000 but continues to maintain the park for the benefit of all.